Societies that exploit animals for food are the main cause of world hunger because they feed a disproportionate percentage of the world's crops to 60 billion land animals annually killed by the meat, dairy and egg industries worldwide and tens of billions of marine animals (yes, we have fish farms nowadays)—instead of 7.5 billion people on the planet! Do the math. You don't have to be Einstein to figure out this equation. 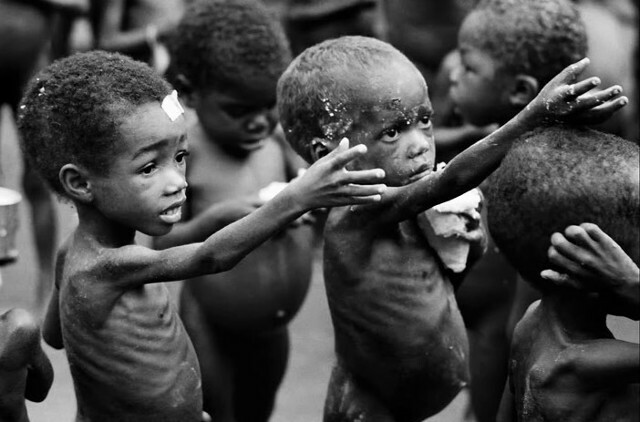 Every two to three seconds some human (most likely a child) starves to death, while pigs and cows continually get fat. Even the Council for Agriculture, Science and Technology, a group comprised of people involved in animal agriculture, acknowledges that 10 billion people could be fed with the available crop land in America if everyone became vegan. One acre of land can yield 30,000 pounds of carrots, 40,000 pounds of potatoes or 50,000 pounds of tomatoes. However, one acre of land can yield only 250 pounds of meat. Why? Depending on the animal in question, it takes from three to twenty pounds of vegetable protein to create one pound of animal protein. Thus it has been said in many places that animal agriculture works like “a protein factory in reverse.” However, not only does this process squander protein resources; it obliterates carbohydrates and fiber, antioxidants, phytochemicals, and many other nutrients altogether. Jeremy Rifkin, a widely respected author on issues of worldwide food supply, traces the occurrences of famine directly to our increasing tendency to use precious food resources as animal feed. In his editorial piece There's a Bone to Pick with Meat Eaters, published in the Los Angeles Times in May 2002, Rifkin states that 36 percent of all the world's grains are fed to food animals; in the U.S. the number is a staggering 70 percent. (Many estimates have the worldwide number as high as 65 percent. Either estimate is obscene, and proves that eating animal-based foods is the worst form of human and animal abuse.) In emerging nations such as China, Egypt, Mexico and Thailand, the portion of arable land used to grow animal feed has increased since 1950 between threefold and thirtyfold, depending on the country. An acre of cereal produces five times more protein than an acre devoted to meat production; an acre of legumes (beans, peas, lentils) can produce 10 times more protein; leafy vegetables, 15 times more protein. (Please click the link above to read the entire article.) What's more, the production of surplus amounts of grain in the U.S. frequently results in obscenely unjust exchanges of food resources that take place between the U.S. and many Latin American countries, for example. If soybeans, vegetables and grains were fed directly to humans, instead of to animals whose lives were forced into existence in any event, we could alleviate much world hunger by putting an end to these unjust transactions. This is why the world's largest feed-the-hungry organization—Food for Life Global—feeds millions of hungry people free vegan meals on a daily basis! It's no accident that many of the same factors that make animal-based agriculture an environmental disaster also make it disastrous when it comes to feeding the world's human populations. 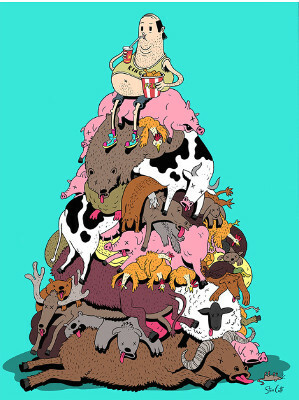 As noted in the essay just prior to this one, Animal Agriculture and Environmental Destruction, sustaining a meat, dairy and egg-eating culture requires 20 times more land, 14 times more water, and from 10 to 20 times more consumption of fossil fuels and other energy sources, than would be required to sustain a purely vegan culture of the same size. (It's also worth noting that the American people—the most wasteful culture on the planet—comprise less than five percent of the world's population, yet they consume 20 percent of the world's animals raised for food.) Animal agriculture is not only evil to the animals that it imprisons, enslaves, tortures, and kills; it is monumentally evil when we consider the harm it wreaks on the natural environment and the health of individual persons, its devastating impact on health-care systems all over the world, and finally, its exacerbating effects on world famine and hunger. GO VEGAN! It's simply the right thing to do.